Exercise bikes are everywhere these days, and there are a variety of different types available too. With many people choosing a bike over a treadmill, today we’re going to look at bikes available for under $200. That limits the selection, but I’ve broken it down for you into a few different picks. That way if you have a preferred type of bike, you can give that type a look. 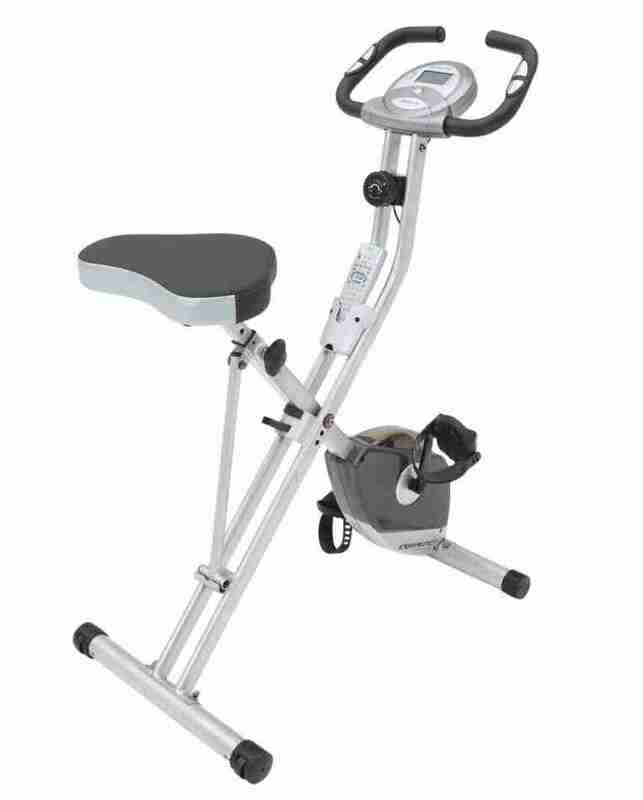 Overall though my recommendation stays with the Exerpeutic Folding Magnetic Upright Bike. This is because the bike has the most versatility, comfort, reliability and usability of the entire selection. The other choices are great IF you want that specific type of bike. They might even be better than the Exerpeutic in a couple of categories. For an overall user it’s the most reliable choice though. A smart looking bike which is also foldable, and is easy to assemble. The Exerpeutic folding upright bike is our top pick overall because it has a very user friendly design and differences in your build/size don’t affect your ability to use the bike. It performs very well and has great potential. You can keep development going for a while thanks to different resistance levels. Folds away similarly to an ironing board. The weight on this isn’t too heavy either, so once folded you can easily move it out of the way. Once folded it could fit into a large cupboard or other storage space, so it’s a great home machine. The size when properly set up is big enough to be comfortable yet small enough to comfortably get on and off of. It handles a weight of up to 300 lbs thanks to the sturdy frame and design. The seat is nice and large as well, and there’s a good amount of cushioning. It can also be adjusted for different users, again accommodating different sized users. The user friendliness of the Exerpeutic Upright Bike doesn’t stop with the comfort. There’s a clear LCD display to show various data like distance, speed, time and calories burned. It’s very quiet when in use as well because the mechanism is magnetic. This also makes it fast and easy to switch between resistances using the knob attachment. Pedalling motion is also nice and smooth. While being a good all-around bike because of the 8 resistance levels, this doesn’t cope well with intense sessions. Upright bikes in general just aren’t designed for overly intense sessions. For those kinds of workouts, a spin bike would probably be better. Some magnetic bike mechanisms begin to get less effective over time. This is because they use resistance pads to operate, and these are vulnerable to being worn down. Basically this means your bike might need replacing after a few years of heavy use. A great all-around recumbent bike which comes in under the $200 mark. Marcy are a well-established fitness company and have been around for decades. The ME 709 is a cheap and easy to build bike with plenty of usability. The resistance can be moved between 8 different levels and the pedals are well designed. There’s a good number of nice features too, as expected from a good bike, though some people have suffered reliability issues with this particular model after heavy use. You’ll be hard pushed to find a recumbent bike of this quality for $200 or under though, so this remains our recumbent pick. For more recumbent bikes in general, click here. Recumbent bikes tend to be more expensive than the standard upright version, so this is a bargain buy. More than that, many users have entirely reliable experiences with this bike and haven’t suffered any issues. It’s only some users who seem to have problems with a couple of parts breaking or stopping working. Marcy is also very good at providing support to any users who do happen to suffer problems, so I’d feel quite safe giving it a go if a recumbent is needed. First off, putting Marcy’s ME-709 bike together is very simple, just follow the instructions. It does recommend two people to put it together and that’s a good suggestion. A couple of steps will require the second person to make it much easier. Following that it’s simple to make adjustments so it’s comfortable for your build. The resistance is controlled by turning a knob and uses a magnetic system. Having counter-balanced pedals is a nice feature as well because pedalling is now more comfortable. It also feels like the pedals are much more under your direct control. A nice padded seat is also provided as standard. 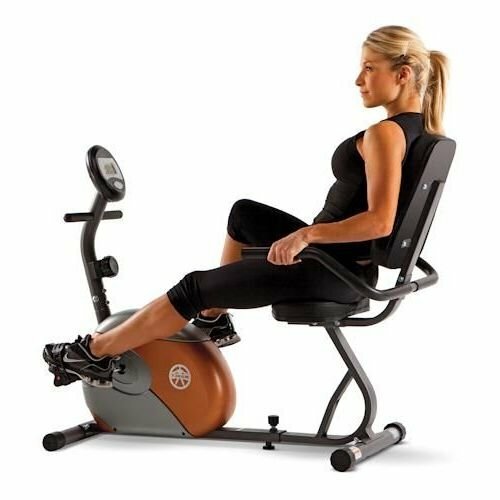 Being able to do a seated workout on a recumbent bike like the Marcy ME 709 is a great way to work around joint or mobility issues. It can also let you work around injuries or make a great rehab tool. As I mentioned in the summary above, this bike has been known to suffer some problems with a couple of parts, such as the pedals. The work-around here is that there are many, many more happy users than those who are unhappy. Marcy also provides good customer support, so check with the vendor about support and warranty details, and you should be fine. DeskCycle have created an awesome little device which can fit under your desk at work. If you’re trying to fit in more exercise and struggling for time, their pedal exerciser could be the perfect solution. It’s also a wonderful tool for people trying to get a lot of training time in, for endurance events for example. This fits under a desk nicely and is so easy to use that many people have said they forget they’re even pedalling! Putting it together is very easy and only takes a few minutes. The reason it feels easy is a smooth, effortless motion at lower resistance levels. Move the resistance upwards and you will definitely start to notice it. Along with well sized and smooth pedals, there is an LCD display included for things like speed, distance and so on. 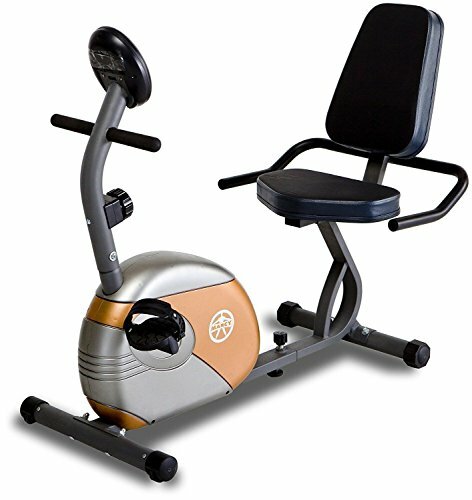 The display is separate to the DeskCycle pedal exerciser itself. That’s important because you don’t want to have to get under the desk just to check the display. Instead you can have that on your desk and give it a glance whenever you like. It connects to the main unit with a simple wire which can easily be tucked out of the way. 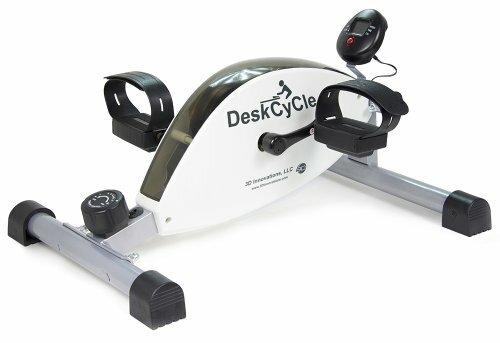 This desk cycle is made to sit around a height of 10 inches, and many people don’t have desks that have a 10 inch clearance space already. This could make it less usable for you, so be sure to double check before you buy! Once you start kicking resistance up through the levels you will definitely start to notice it. Because you’re putting more effort in, it will affect your ability to write or type normally, and will also start to affect concentration. At the highest settings it’s near impossible to actually focus on work, so they become a little redundant as a desk exercise. They could still be useful to those who just want to sit down while using it though. The Sunny SF-B1001 bike is pretty much at the $200 limit, as it sometimes drops to 200 though is usually just a little bit over. 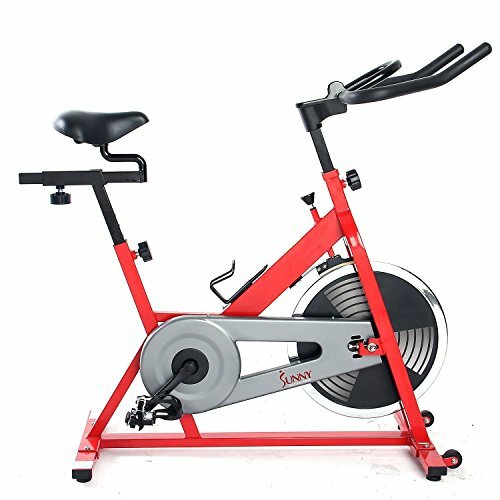 Finding a good spin bike in this price range is difficult though, and this one is worth going just slightly over the budget for. Sunny are a highly reliable brand and produce many other quality bikes, as well as other cardio equipment. This is made from high quality steel and doesn’t shake or have any movement whilst being ridden. It’s got a solid design as well and we’ve found that most users have had no problems. The resistance works by using resistance pads which will need replacing roughly every couple of years. You can get the perfect riding position for yourself thanks to adjustable handlebars AND an adjustable seat. Any good spin bike should have both of these functions. The Sunny spin bike also has a water holder included and a smooth chain motion providing the resistance. These make it even more comfortable for the user, as pedalling is smooth with no jerkiness. You can push on to some really hard workouts with the varying levels of resistance. You can also use the lower levels to build up still, and trying different workout styles gives even more variation. Overall there aren’t many users who would need to go beyond the capabilities of this spin bike. One of the things to be cut from this budget-price bike is the electronic monitor. There is no screen or feedback system, so you have to rely on yourself to monitor the time and just push yourself for results. This works for many people, though for a beginner it could be very intimidating. Let me start by saying that Sunny definitely have a reputation for making reliable products. The SF-B1001 is definitely one of their products known for good performance in this category too. The actual warranty provided only covers 90 days of use though. It is definitely worth looking into an extended warranty for a little peace of mind, but like I said, it should hold up anyway.